Corks are removed without tearing the by means of a cork puller with a flat hook at the end. The extractor is inserted at one side between the bottle and the cork, and a twist places the hook where it will fit under the bottom of the cork. Then a slow, and steady pull will remove the stopper, usually with little difficulty. Purifies the Blood. Regulates the liver. In 2008, I blogged about missing out on a Williamson patent spoon with folding corkscrew carrying an advertisement for Wah-Parilla. Ever since, I have been on the hunt for another one. Last week, a Wah-Parilla spoon was listed on eBay, and I put it on my watch list. And, the auction was ending yesterday. With a snipe bid set, and the spoon sitting at 77 dollars, I hoped for the best. This morning over coffee, I checked email, and I had indeed won the auction. A fair amount above the 77 dollars, but quite a bit less that my snipe bid. An excellent addition to the collection! But, what is Wah-parilla you ask? The best spring tonic is Wah-Parilla, a purely vegetable remedy compounded from medicinal roots and barks—mainly Wahoo and Sarsaparilla. It corrects the liver, stomach, bowels, and purifies the blood after nature’s methods—pleasantly and certainly. is guaranteed to give a positive benefit. A printed guarantee accompanies every bottle, with instructions to the dealer to return the money if the purchaser is not satisfied with the result. Don’t risk taking mercury and potash—get the pure vegetable blood purifier—Wah-Parilla. At druggists. Now, the buy it now price was fair, and as you all know, I am always looking for a deal and could have made an offer. That said, had I not clicked the Buy it Now button is surely would have been snapped up. So what is this “pivotally and foldably” thing you mention? A very cool little corkscrew that will make for a nice addition to the collection. As you will note from the pictures, the piece is marked STERLING, and carries a monogram of A.L.N. Who might have owned this piece? What might the ALN stand for? I am aware that I have been a little quiet as of late, and truth be told my focus has been more on the wine shop than on corkscrews. Still, in between the shop and putting up the finishing touches on the latest issue of The Bottle Scrue Times, I have managed to pick up a few corkscrews. This is a double for me, but the deal was very fair, and…well… how could I resist. This little guy was on eBay, and had a poor photo. But, he is actually in pretty good shape. Just so I can get a head start! One of the corkscrews that has been on my wish list for some time is the Curley patented corkscrew that is marked EMPIRE across the handle. Given the variety of Curley corkscrew out there, it is one that really does “belong” in the collection. And, one was listed in the first round of the collectorcorkscrew.com’s auction that ended over the weekend. These rarely turn up, and the one that came out of Fred’s collection ended up in Ion’s hands. I am pretty sure BT already has this one, and I wasn’t sure if JM had one already. He really likes Curley’s as well, having jumped on an embossed one at the ICCA AGM. Knowing what he paid for that one, and that Fred’s commanded a fairly high amount. I placed a bid and hoped–not expecting to prevail. When the auction ended, I was indeed the highest bidder. But, alas, the reserve had not been hit. After a few emails, and a little negotiation, a deal was struck however. And, the Empire Curley will be heading to the island, and will be added to the pile of Curleys in the collection. Soon it will also to be added to the Curley corkscrew page. Round three and four of the auction will be ending this weekend. Bid high and bid often! The first round of the auction ends tomorrow! It’s time to get your bid on!!! Let the bidding wars commence!!! Before you get all excited for me, I haven’t found a Finsel patent (YET!). But, not for a lack of trying. 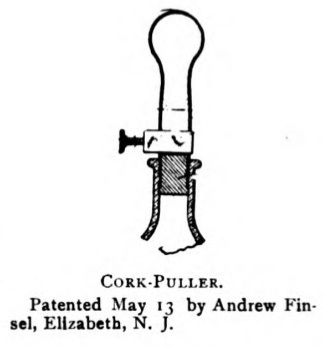 If you DO have a Finsel patent, and want to make a trade, I would definitely like to add it to the prong puller collection!